Fabulous Ocean Front View From Our Newly Remodeled Condo! Nothing stands between you and the ocean but the carpet of beautiful grass under your feet. RENOVATION Completed. Ocean Front Condo steps to both Kamaole I and Kamaole II beaches. Our Beautiful lanai spills onto the grass area making our view unforgettable. No elevators to navigate to get to the best snorkeling on the island. We have enhanced our views of the Ocean with our newly installed sliding windows in both the living and master bedrooms. 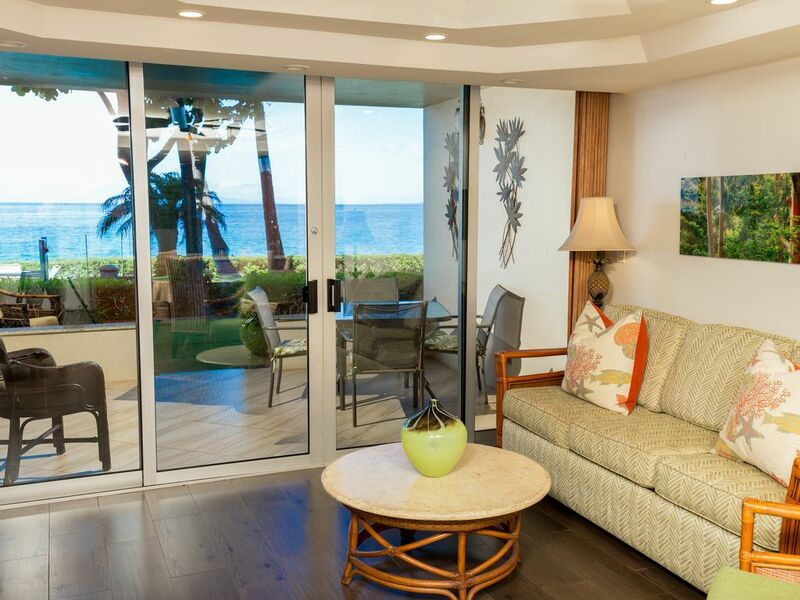 This upgrade allows for full, unobstructed views of the famous Maui sunsets. This popular and well maintained resort is nestled between the best south Maui beaches Kamaole I and II with exceptional swimming and snorkeling outside your door. Our 2 BR apartment has been completely renovated with new furnishings and authentic Hawaiian hospitality. New LCD TV's in the Living Room (40 inch; Smart TV connected to internet)(Blu-Ray Player), Master Bedroom (27 inch; w/Apple TV) and guest bedroom (27 inch; w/Apple TV). THREE LCD TV'S TOTAL! The Master Bedroom includes a king size bed with 100% cotton sheets, large walk-in closet and FULL OCEAN VIEWS. Our second bedroom includes 2 twin beds with 100% cotton sheets, double door closet and Garden View. The OCEANFRONT ground floor lanai flows out onto a luxurious grass and garden area only a few steps to the beaches and fresh water pool. Also unobstructed views of Molokini Crater nearby and the West Maui mountains. The desirable ground floor unit is perfect for any age and any family. The Royal Mauian is one of the most well loved condominium complexes in South Kihei. Walking distance to many specialty shops, restaurants and nightlife. Minutes from WAILEA shops and fine dining. The rooftop garden (completely refurbished in 2010) is unique and available for private sunning. The full kitchen and BBQ also make a perfect gathering place for meals or enjoying sunsets. Local, on-Island rep: Maui Condo & Home, LLC. We are at the best beaches in Maui. Kama'ole Park is divided into three distinct beach areas. Kama'ole I has the largest and loveliest beach of the three with fine white sand and great swimming conditions. There's even a grassy area at the south end for picnics and playing. Kama'ole II is located a little further south and the beach is a little smaller but has also has good swimming. Kama'ole III is very popular with the locals. The waves here are more consistent making it a great place for boogie boarding. The sandy beach is small but it has a large grassy area, perfect for kite flying, picnics, and relaxing. World class shopping is minutes away at The Shops at Wailea. There is a wide selection of shops and restaurants available. Tommy Bahamas is a favorite place to hang out with local music nightly. Ask for the lunch menu for dinner time – the Steak salad is a must. You will also enjoy golfing; the Maui Ocean is seen from most holes on the courses in Wailea. Enjoy long walks along the beach and pathways connecting each beach - we actually walk from Royal Mauian to the Grand Wailea and back in just over one hour. Enjoy paddle boarding - if you have not yet tried this you MUST. Snorkeling/Scuba boats and tours launch 1/2 mile away with 2 trips daily to Molokini Underwater Crater, but you may also rent equipment across the street and encounter wide varieties of sea-life near the volcanic granite seawall a few steps from our door. Yoga is 2 times a week at the lawn next door. Check with the front desk for a schedule. We are ground level on the water between the two most beautiful beaches in Kihei. Free Parking for One Vehicle. You must register the vehicle with the front desk upon arrival. Various pool/beach toys are on lanai. These are left behind items from previous guests. Beach Towels available in condo. Ocean front lounge chairs perfect for reading and sun bathing. Wailea Golf Resort just minutes away. Blu-Ray Player in Living Room. Apple TV's in both bedrooms. As soon as you walk in the door, you are greeted with a full ocean view from the kitchen/living area and Master Bedrooms. The amenities in this condominium are amazing, everything you need is there. You can tell that the owners are meticulous and pay attention to every detail. The place was spotless and the grounds are well manicured. There were an abundance of turtle’s right in front of the condominium. We were a little late for the whales; however, we did see a few in the distance breaching the water. The rooftop BBQ area is well equipped even with a small kitchen with refrigerator and sink for extra preparation of your meal. The views from the rooftop are amazing! Mahalo to the owners for allowing us to stay in your beautiful place. Excellent location, convenient and very comfortable. Very nice property...the only thing they don't have is a hot tub. Mahalo for your review. We look forward to your next visit. This beautiful condo was just as described. We stayed there for 8 nights. I wish we had stayed longer!! It was perfect staying on the 1st floor because we were easily able to walk out onto the lawn or to the beach. The beach is on each side of the condo and is beautiful! We loved snorkeling in front of the condo. This condo is walking distance to a natural grocery store where you can find Maui-grown fruits and veggies. It is also walking distance from several great restaurants and food trucks! The inside of the condo is in great shape. It has comfortable furniture and all the pots and pans you’ll need. I love that it had nice knives and a knife sharpener!! I highly recommend this condo. Mahalo for your great review. We work hard to ensure that our condo is in perfect shape for each guest. We look forward to your next visit. This condo and complex is a treasure. Our condo was well appointed for comfort, efficiency, and beauty. With oceanfront views and beaches to enjoy, our vacation was a success. The condo complex has friendly features, like the rooftop BBQ area, lovely tiled pool, manicured tropical grounds. There is a sense of community here and the location appeals to all ages. The ground floor condo was perfect for us. It expanded our views and outdoor living space. The trade winds were mild during our visit, and the water crystal clear for good snorkeling and paddling. Whether or not you are looking for activity or serenity, we highly recommend this condo and experience. Mahalo for the lovely stay and responsive owners. Waterfront location can't be beat! This ocean-front condo was clean and comfortable. I would recommend it for families but not necessarily two or more couples as all the interior doors (including the bathrooms) are open-air plantation-style doors so the privacy is a bit impacted. The unit was missing a "welcome" manual so we had to do a bit of guessing with regards to how things worked on property but it wasn't a big deal. If you are a light sleeper, bring earplugs as the waterfront bedroom is next to the pool pump house and there is a mechanical generator noise that happens periodically. The garden-view bedroom also houses the electrical panel box and there is a constant drone/hum that gets louder if you turn the bedroom ceiling fan on. Minor inconveniences that a good pair of earplugs will solve. We loved the Tommy Bahama beach chairs. Perfect for our beach days. There was a set of fins with one missing a strap so my resourceful hubby fashioned one out of some discarded goggles and they worked good as new. Beach towels were also much appreciated. The "starter" supplies like soap and shampoo, etc., lasted us 10 days so that was a nice surprise. The kitchen is well stocked with nice Cuisinart knives which seem to be rare in these rentals. Having a W/D in the unit is also a big plus! Condo is within walking distance of many shops and restaurants including two excellent bakery shops! Sunsets were gorgeous, especially from the rooftop. We even saw the infamous "Green Flash" twice! Overall a great stay. Mahalo for your review. We were just on island and have addressed all items that you called out in your review. We do have a welcome manual, our cleaners may have put it in a drawer, I will address that with them. Thank you for bringing these items to our attention. We hope that you will return as a guest soon. We loved this lovely little condo. So convenient to great beaches and great food right across the street. At the end of a beach day it was great to relax by the pool. Lots of turtles swimming right in front of the condo. Love this tastefully decorated ground floor unit. We are located across the street from Rainbow Mall - with boutique restaurants, snorkel rentals, tours (whale watching, luau, etc. ), coffee kiosk, roof top BBQ for sunset dining. Walk to the best beaches in South Maui, Kam I & II are great beaches for your morning walks.